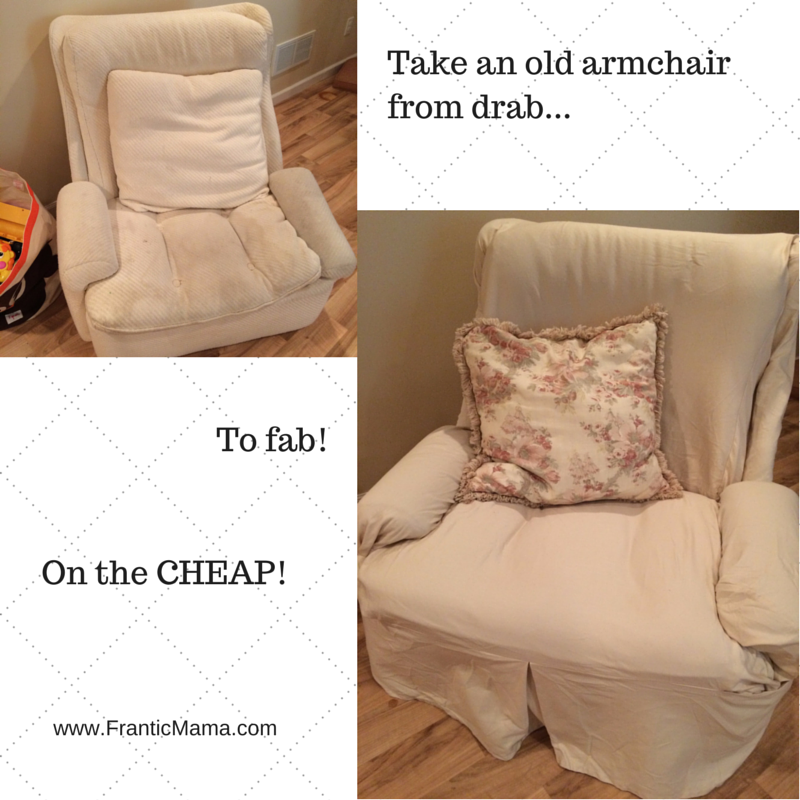 Frantic Mama: Cheap or Free DIY Updates for Your Home! Once in a while, I get on a DIY kick. I don't like buying something new if something old still works, but if it's ugly, well... it becomes harder and harder to live with, especially if you are home All. The. Time. Recently, it was Do-it-Yourself Time, Frantic Mama-style. Here are my 3 most recent projects. I simply unscrewed the fan blades from the unit and cleaned them off. Then I sprayed on a coat of of Rust-Oleum primer. An hour later, I sprayed two coats of Rust-Oleum Espresso Satin Finish (within an hour of each coat). I don't like asking my husband to do extra chores around the house because he already devotes any free time he has to our family; I didn't bother him with the electrical situation of unhooking the fan base (and heck no, I'm not doing it!). So for now, I'm leaving the base alone. 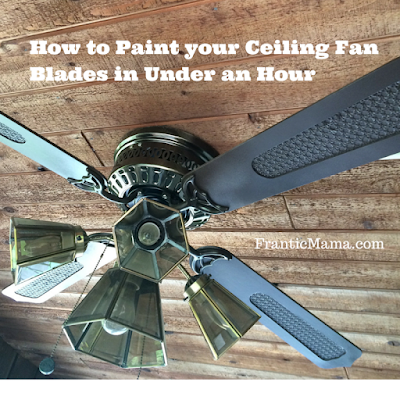 It may not be perfect, but it's less noticeable and way cheaper & easier than installing a brand-new fan! I recently recovered the dirty old hand-me-down chair we have in our basement that I'm almost too embarrassed to show you (to my credit, I usually have it covered up with throw blankets, but I'm sharing it with you here in all it's naked glory). I ordered the Loose Fit Square Cushion Tailored Armchair Slipcover in Natural from UglySofa.com for under $30. The slipcover is by a store that rhymes with Tottery Parn, but Ugly Sofa sells them cheaply (I don't ask questions). The trick with slipcovers is to iron out all of the wrinkles first and then just keep stuffing the fabric in between the cushions until it is tight. I also secured the tight corners in the back and around the armrests with corkscrew upholstery pins. Again, it's not perfect, but it's for a basement after all! I also swapped out the extra [drab] white pillow for something we already had that has some color in it. 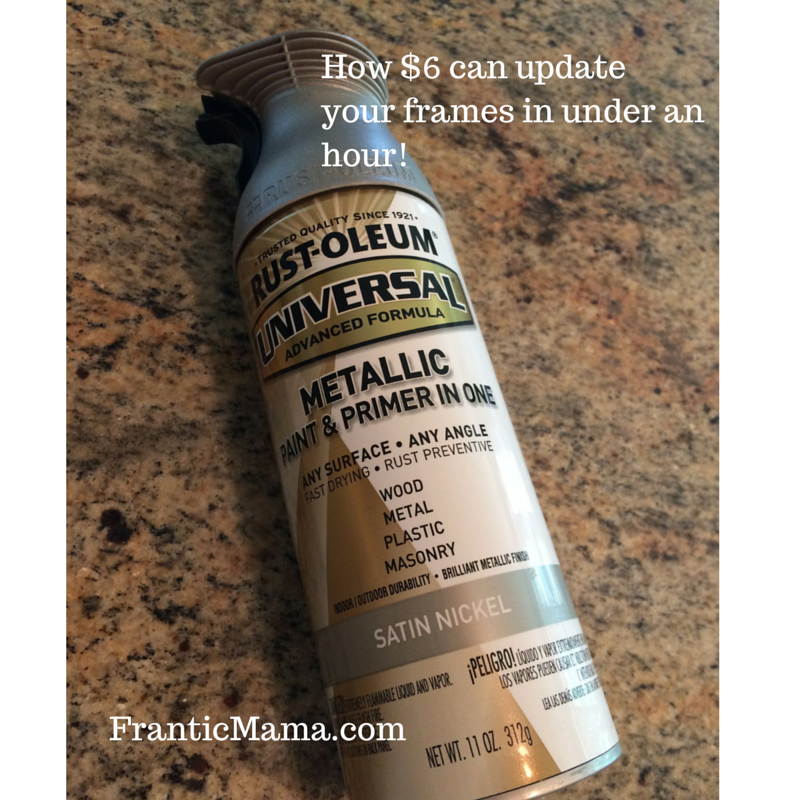 Last but not least, in under an hour, I updated 3 mismatched picture frames using this can of Satin Nickel spray paint I bought at Lowe's. First you need to take apart the frames, which can be tricky if they were professionally framed (because there are nails on the back). 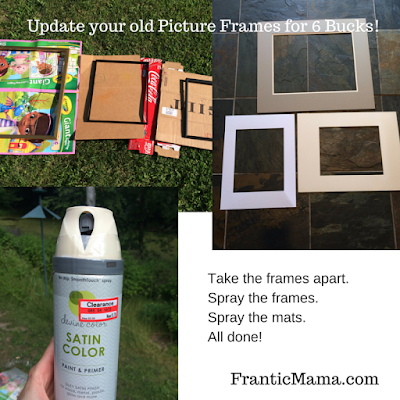 Use a screwdriver to pry the nails up (or remove them) so you can remove the backing, the glass, and the photo (you'll put them back together the same way when the paint dries; I also used masking tape to re-secure the photos and mats). 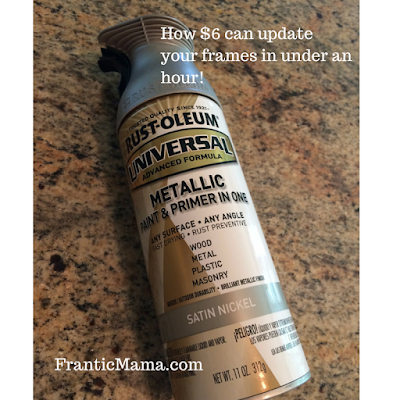 I placed the frames on cardboard outside, and sprayed 2 coats of the Rust-oleum on them (no, I didn't sand them first-- I live on the edge!). Then I used off-white spray paint for all three mats (I had to use a few coats, as the spray paint was cheaper (it was on Clearance at Target for under 2 bucks!)). 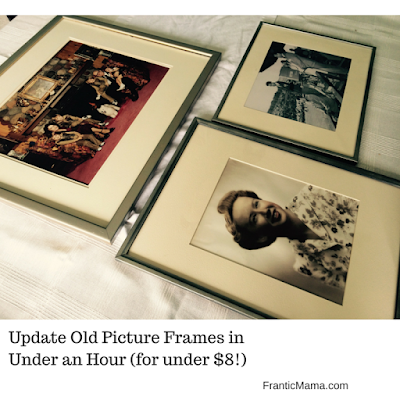 *The frames all feature photos of my husband's and my grandparents; we wanted a cohesive theme and look for the wall. Note: These projects were only do-able when my kids were out of the house with my husband on and off over a few weeks time period. Everything takes A LOT longer with little ones trampling about! What DIY projects have you or would you like to work on around the house? Any favorite resources? Wow your DIY projects are impressive. You did such a good job on each one. This has given me the incentive to follow your lead around my home. Thanks for the post!!! Thank you for reading! I'm glad I inspired you :). Ooh, you did a great job! I would say though, please please go to a college bookstore or order some framing tape or artists tape. 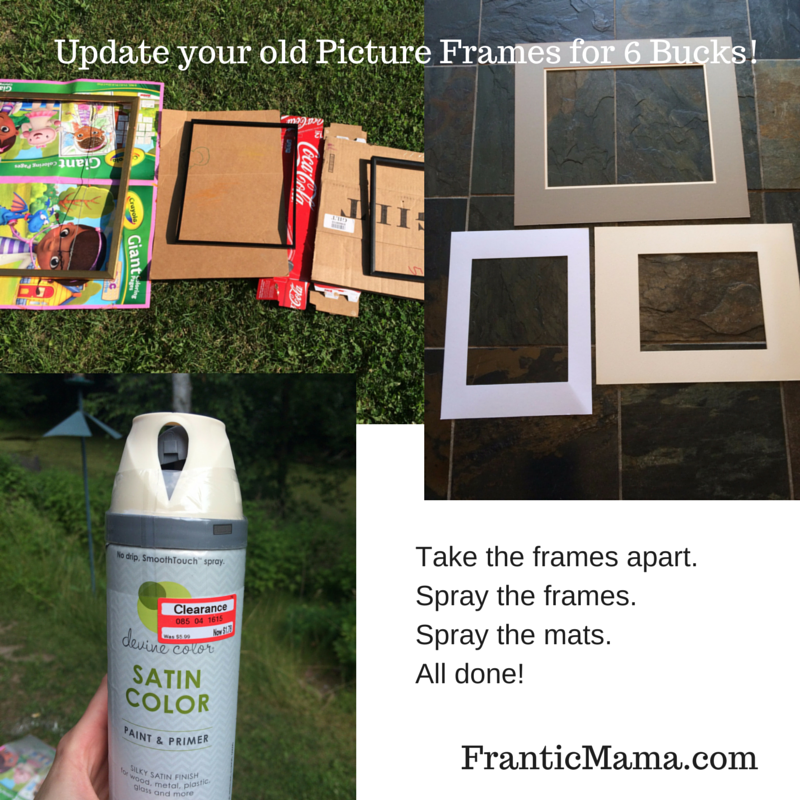 It doesn't have the acidity of masking tape and won't damage your lovely photos, especially if you ever decide to reframe them. Masking tape can be such a bear to get off! Now, will masking tape ruin the photos if I'm just using it on the back of the photos to tape them to the mat??? The acid seeps into the photo material and over time will discolor it. "Acid is a nemesis of artwork. Given enough time, in direct sunlight and high humidity, it can cause a hazy brown effect called "acid burn" that can devalue and ruin artwork." I like your photo frames so much!! Such a clever idea too. They look dainty.It is a relief to set eyes on neutral pastel shades when you are surrounded by green ,red ,yellow and blue!! New motto- keep calm and diy. Thank you so much! Haha, yes, few things in my house could be considered "dainty" at this point, so it was time for a project!